Doda,April 14 (Scoop News)- Leader of opposition in Rajya Sabha and General Secretary AICC Shri Ghulam Nabi Azad said that Modi Govt. has weakened the democratic and constitutional institutions established and strengthened in the country for the past seven decades by the successive governments right down from Pt. Jawahar Lal Nehru regime. Remembering the Architect of Constitution of India Dr. B.R. Ambedkar, while addressing series of election rallies in Ramban and Doda Dist. 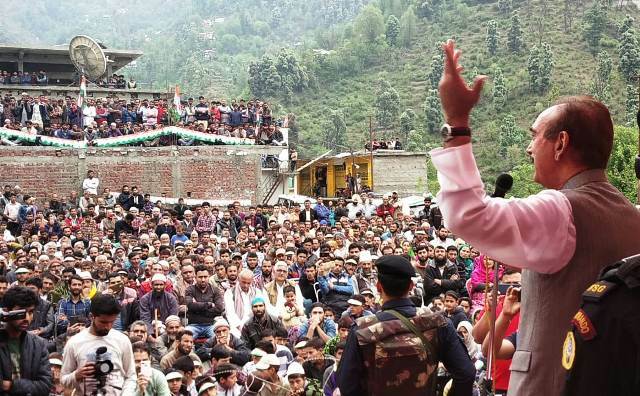 Ghulam Nabi Azad said that mandate in the constitution was carried out by establishing strong constitutional and democratic institutions in the country which are the pillars of strong and vibrant democracy. However, Modi regime and BJP have made every attempt to weaken and politicizing of such institutions by various modes, which is very harmful for the largest democracy in the world and these are the danger signs for the future of democracy in this country. He said that erosion of authority and diluting of the democratic institutions are the indications of weakening of democracy. Lashing out at the economic policy of Modi Govt. Shri Azad said that the Modi Govt. pursued pro-rich and anti-poor policies which have got havoc for poor and common man of this country. He said that cost of the essential commodities of life have gone several times high because of unprecedented hike of petrol, diesel, ration and all commodities of daily use, making it difficult for poor and common people to survive. He said the farmers continuously committing suicides for failure to re-pay farming loans and Modi Govt. remained indifferent. However the chronic capitalists close to corridors of power ran away after looting tax paid money from banks. He said Congress party has come out with “ Minimum Income Guarantee Scheme” under which Rs.72,000 will be deposited directly in the bank accounts of poor families and more than 5 crore families will be benefitted by this historic step. He said that this is a most revolutionary scheme for economically poor people of this Country. The unemployed youth are without jobs, the demonetization had brought disaster for small and medium businessmen but Modi Govt. is least bother about the people’s problem. It has learnt the art of diversion of attention of people from real issues. He said that Modi Govt. has started to issue certificate of nationalism and question the patriotism of any one of this country on the basis of religion and caste. He asked the misguided people to read and refresh their memory from the history about the contribution and sacrifices of each country man irrespective of caste, color or creed in making India since post-independence. Azad said those misleading younger generations and distancing height for their short term objective of vote bank politics are doing great de-service to the nation by weakening religious tolerance and unity in diversity. He said that the politics of polarization is suicidal for the strength of our nation. Shri Azad said that Modi Govt. has nothing to market their achievements during past 5 years and they are banking upon emotional issues of religion and region and achievements and sacrifices of our security forces. He said that numerous development projects were undertaken during UPA, Govt. at the Centre had extended all sorts of help in order to ensure all round development in the state. Shri Azad appealed the people to vote for Congress party and ensure the victory of its nominee Shri Vikramaditya Singh for the larger interests of nation.